Dubai: Glenn Maxwell unleashed an array of unconventional shots to crack 98 runs and put on a record 134-run sixth wicket partnership with wicketkeeper batsman Alex Carey to give Australia a challenging total of 277 for seven in an inconsequential fourth One Day International of the five-match series at the Dubai International Stadium on Friday. Maxwell displayed his reverse sweeps, scoop shots and his exquisite pull shots during his 82-ball knock, studded with nine boundaries and three sixes. 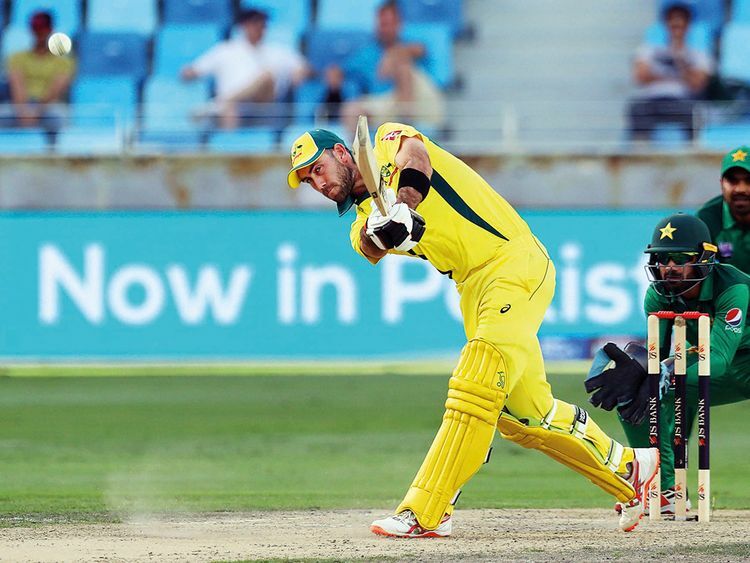 Carey, who scored his maiden ODI half century (55 runs off 67 balls), during his 21.1-over partnership with Maxwell — the best against Pakistan for the sixth wicket. Maxwell got run out only two short of his century after a sharp Shan Mashood throw from deep to wicketkeeper Mohammad Rizwan while attempting a second run. Earlier, skipper and opener Aaron Finch and Usman Khawaja gave a good start through a 56-run partnership. Khawaja went on to hit 62 runs off 78 balls while Finch fell for a quickfire 39. Pakistan skipper Imad Wasim, who led the Pakistan side for the first time in the absence of Shoaib Malek owing to a rib injury, won the toss and elected to field. Finch began with a superb shot by rising on his toes and hitting Usman Shinwari square off the wicket for a boundary. Left-handed Usman Khawaja too played a similar shot off Shinwari. Finch began to play some glorious drives all along the ground off Shinwari and Junaid as Khawaja played second fiddle. The 50-run partnership came in 11.2 overs with Finch dominating the batting with 36 runs. The pair put on 56 runs in 12.1 over when young Mohammad Hasnain trapped Finch leg before for 39 runs with sheer pace. Shaun Marsh, who joined Khawaja, lasted only 16 balls to score five runs when Imad Wasim had him stumped by wicketkeeper Mohammad Rizwan. Peter Handscomb and Khawaja added 33 runs in 5.3 overs before Wasim struck again to have Handscomb caught at slips by Haris Sohail for just seven runs. Khawaja reached his ninth ODI half century in 64 balls. Maxwell, well known for his ability to hit his team out of trouble, lifted Shah for a six over long on. At the half way mark, Australia were 120 for four with runs not flowing easily as in earlier matches. Maxwell and Khawaja put on 39 runs in the next six overs when Shah trapped a well-set Khawaja leg before for 62. Carey joined Maxwell with Pakistan on top, having taken five wickets for 140 runs in 28.1 overs. In the five overs between 35th and 40th over, Australia could muster only 21 runs. However, Maxwell and Carey stabilised the innings with a 50-run partnership off 70 balls. Maxwell reached his 18th ODI half century in 53 balls and then went on to celebrate it by hitting a powerful six off Wasim over long on into the stands. He also hit Shah off the back foot onto the sightscreen for another six. Maxwell, when on 76 had got bowled off Shinwari, but replays showed that Shinwari had overstepped. The in-form Australian then celebrated his luck by hitting the free hit for a one bounce boundary to the mid wicket. Brief scores: Australia 277 for seven off 50 overs (G. Maxwell 98, A. Carey 55) vs Pakistan to bat.